ok sign me up for 1 x LH351D 4000K 90CRI . In TLF I have registered one FW3A (219.Meyer on the TLF-list) and opted for a second one. To be on the safe side please put me on the BLF-list with one XPL-HI 3D and one LH351D. Got a message back from Digikey again. And good news! Great for the FW3A groupbuy, but not too great for smaller buyers. For individual samples(less than a reel), the tint bins are randomly available from T6, TA, T7 and TB. No wonder the LH351D from Bob Mc Bob looked so green. For a 1x reel LH351D (like our groupbuy), the only tint bin confirmed and available is T6, so way better than the 2nd and 3rd batch of LH351Ds, so about as good as the 1st batch from AEDe, but still not the godly T2/T4 bin. HOWEVER, for 4x reels of LH351Ds, the tint bins are confirmed and available in the T4 and T6 bin, and the T4 bin is way below the BBL and closer to 3900-4000k rather than 4100k-4000k according to the Digi-Key rep. That is very good. There’s an other advantage taking 4 reels rather than one. So not only are we getting a below BBL tint, we are getting one flux bin higher by going from Q2 to R2. Glad to hear this information! I hope Lumintop is able to make use of your research. From the latest list update: 1715 lights x 3 emitters / light = 5145 emitters. My understanding is these are sold in 800 piece reels, or in 4 reel cases (3200 pieces). If Lumintop are willing plan on half of buyers going for the LH351D, plus a modest number of additional sales beyond the group buy, then ordering a case should be justifiable. I will take one. Thanks for doing this! HOWEVER, for 4x reels of LH351Ds, the tint bins are confirmed and available in the T4 and T6 bin, and the T4 bin is way below the BBL and close to 4100k-4000k according to the Digi-Key rep. That is very good. 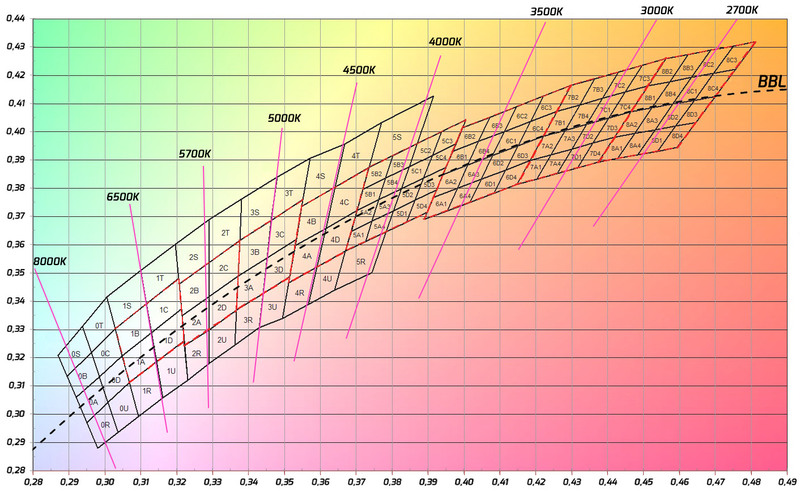 T4 should be 3750K to 3875K, and Duv roughly -.004 to -.010. It looks like there could be a choice to make between rosier tint at a warmer color temperature versus a color temperature with broader appeal plus 20 lumens and a chance of just enough of a greenish tint that discerning users might notice. As a related reminder, Maukka seemed pretty happy with a Carclo triple-equipped light he modded with LH351D’s (TC bin?) that measured at +.0036 Duv (assuming “medium” is the closest condition to the binning conditions of 1050mA). Yeah she was probably wrong in the color temp department. It’s funny though that we got a warmer tint bin with a higher flux bin. That was surprising. Edit: I was the one who was wrong. Transcribed badly on my part. *HOWEVER*, *for 4x reels of LH351Ds*, the tint bins are confirmed and available in the *_T4_* and T6 bin, and the T4 bin is way below the BBL and close to 4100k-4000k according to the Digi-Key rep. That is very good. BlueSwordM, thank you so much for taking the initiative on this! If this works out, we are truly in your debt. 2 weeks ago when ToyKepper proposed 3 choices, the deal was to wait for a better (rosier) tin bin T1, T2, T3, T4. It was not to wait for the greenish T6. for 4x reels of LH351Ds, the tint bins are confirmed and available in the T4 and T6 bin, and the T4 bin is way below the BBL and close to 4100k-4000k according to the Digi-Key rep. That is very good. Interested in 2x lh351d 4000k. I also would prefer below the BBL, but I’m being open-minded because I know some people have stronger feelings about color temperature than I have about small positive Duv values. What encourages me most about Maukka’s testing of LH351D’s with a similar or worse Duv than a T6 should have is he saw limited tint-shift across the beam in a Carclo optic. Find a rainbow beam more distracting than slight deviations from the BBL. Yeah its very green corona/hotspot that is the worst. I can stand above BBL if it’s consistent across the beam (and the CCT doesn’t shift too much either). I’ve been pretty happy with the 4000K LH351Ds I got from Mtn-Elec that I put in my Q8. Don’t have any idea what tint bin they are but less green than a lot of Cree emitters I’ve seen that weren’t specifically binned for on/below BBL. I think it would be useful if you asked to be removed from the TLF list. Yeah, it’s kind of important to be as accurate as possible about the lists. I don’t expect to reach 100% accuracy, but some past projects have gotten as high as ~95%. The list in TLF was updated at last in September 20th.! Guys, I came back for an important exception. I just received a critical email from Digieky stating there was an error in communication about the chromacity bins. While the T4 bins are available from Samsung, they are not available from Digikey at the time! is the design of the light final ? Please sign me up for two FW3As – one of each emitter type. Can I be added to the list for a second one. Total of 2. Been trying to resist but I don’t think I can pick which emitter I’d rather have.